When the Northwestern Elevated Railroad began operation in 1900, Wilson was the north terminal of the line. The Northwestern was plagued by delays throughout its construction and the Wilson facility was far from complete when the city's franchise deadline of December 31, 1899 approached. Only one track was complete between the Loop and Montrose Avenue and the section between Montrose and Wilson was not even that far along. 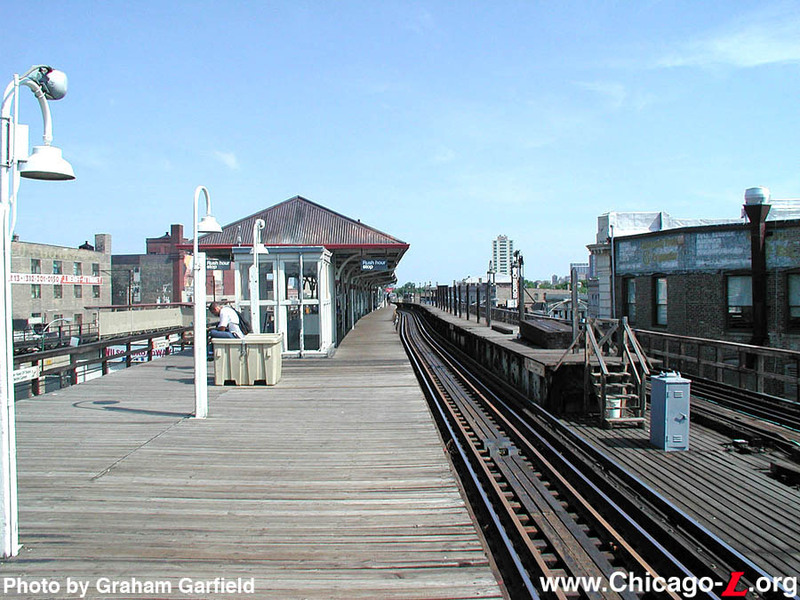 So, to hold the franchise, the Northwestern built a ramp down to grade-level at Montrose and constructed a single track and temporary Wilson station (probably a simple wooden structure) to fulfill the city's requirement. After receiving an extension from the city until May 31, 1900, the Northwestern closed for six months and then officially opened. The Northwestern's first permanent Wilson terminal included a station, yard, offices, and shops. The four-track elevated structure extended a few hundred north feet across Wilson Avenue and then abruptly stopped before crossing the diagonal Evanston Avenue (known as Broadway today). The yard and shops were to the south, between Wilson and Montrose. To maximize space on the confined site, the yard was a two-level complex: there was a sizable elevated storage yard plus a second "lower" yard at ground level below the elevated, with the two linked together by two ramps. A four-track inspection and repair shop was erected on the elevated level. The permanent station at Wilson was a four-track, three-platform facility on the elevated level. All trains, both locals and expresses, departed from this elevated station. The headhouse was at track level at the south end of the center island platform. Access to track level was gained by using one of several staircases on the south side of Wilson Avenue that led to a mezzanine level. From the mezzanine, corridors and stairs led to the east and west island platforms and up to the headhouse on the center platform. This is where entering passengers went to pay their fare and board trains. The station house, designed by architect William Gibb, was of fairly modest size and the exterior of the one-story building was executed in galvanized iron topped with a tin-covered roof. The architectural design was generally Classical Revival in style, and used some influences of the Colonial Revival style. With its rectilinear symmetrical form with center bays, hipped roof with gabled dormers, decorated pilasters, and scrolled ornamentation in the dormer pediments, the station bore a strong resemblance to the station houses formerly at King Drive and University on the Jackson Park branch and Kinzie further south on the Northwestern Elevated. From the track-level station house, passengers were deposited onto the wide center island platform, between what are known as Tracks 2 and 3. This "main platform", as it is described in Gibbs's drawings, was apparently the only one used for passenger loading, based on the fact that the only fare controls were located at the accessway to it. Notations in Gibbs' drawings suggest that the narrower east and west island platforms were used for discharge only. When the station opened, one could see the lake from the elevated platforms. Small farms still dotted the landscape around the station. But improved transportation brought increased development and urbanization. 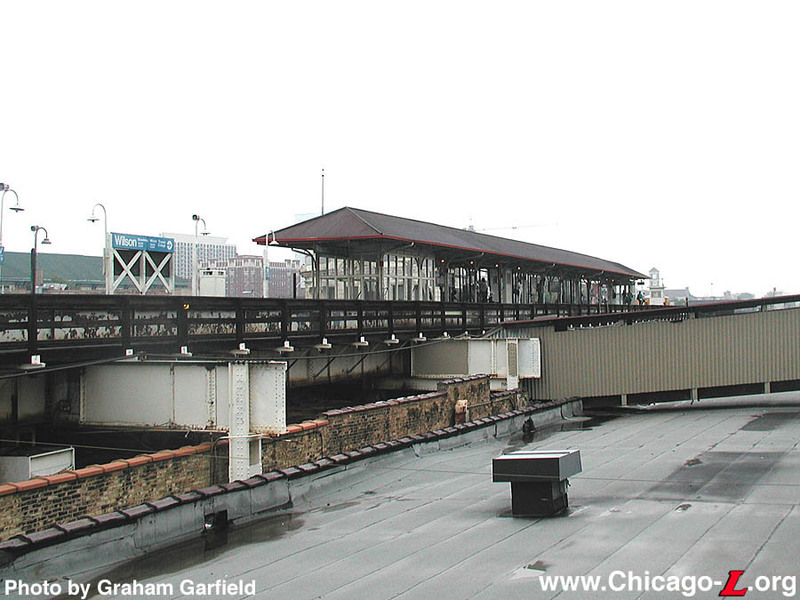 As ridership increased on the Northwestern Elevated and more frequent service was provided, the limitations of the Wilson elevated station were becoming problematic. The stub-end arrangement increased turnaround time, especially with the company's early use of a motor car and trailers. The conversion to multiple-unit operation begun in 1903 helped, but the conversion took several years and more capacity was still needed. So, as early as 1902, the Northwestern began developing plans for an additional terminal adjacent to the previous one, located in the lower yard, where some rush hour trains could be routed. For reasons that aren't clear, this plan took several years to implement. The Northwestern placed the new station to the east of the elevated structure along Evanston Avenue. 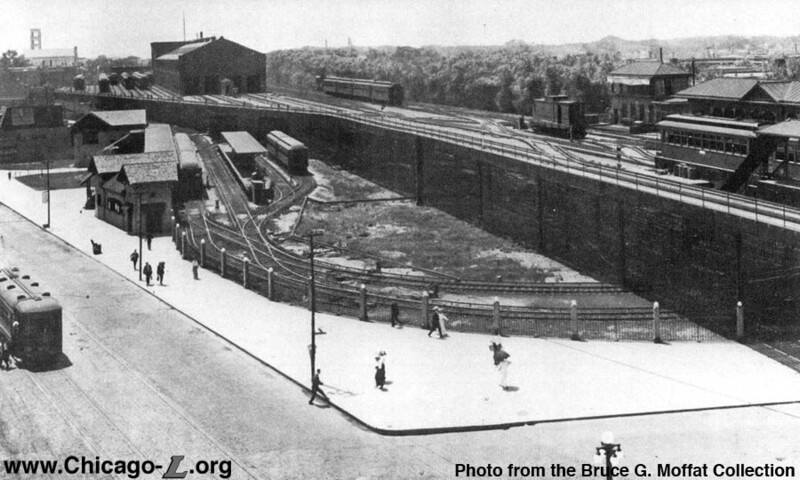 Trains accessed this "lower station" using the existing ramp to the lower yard on the east side of Wilson Shops. 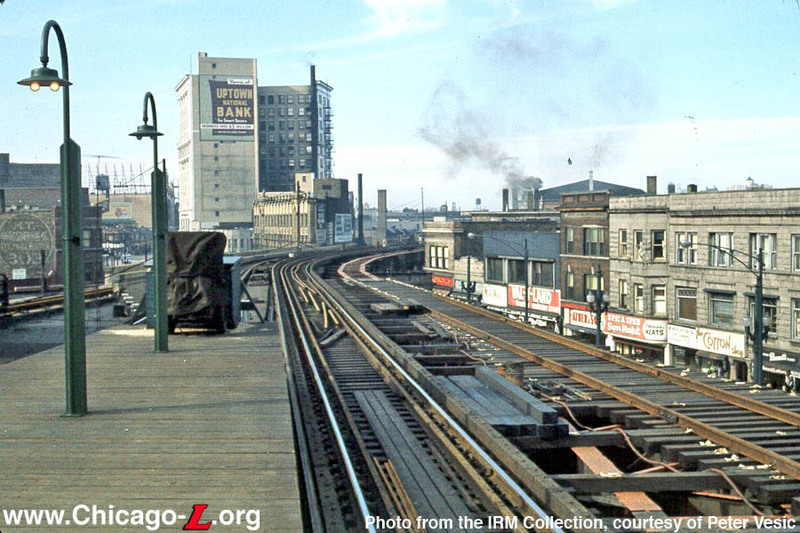 The new station included a loop track that turned west along Wilson and then back south along the west side of the elevated structure. From there, trains could either enter the lower yard or go back up to the elevated and on to the Loop via a second ramp on the west side of the structure. The lower station, which opened on March 5, 1907, featured a modest station house and two platforms. Architect Arthur U. Gerber designed the small headhouse, which fronted onto Evanston Avenue a few hundred feet south of Wilson. The small stucco building had Craftsman styling and was identical in style (if not layout) to his design at Kimball on the Ravenswood branch opened the same year and similar to his work at Linden a few years later. Behind the station house were four tracks with a side platform projecting in a southerly direction from the back of the station house along the easternmost track and a second, island platform set between the next two tracks. Access to the island platform was gained by way of an underground passageway between the two platforms. The fourth track had no platform access. A second detached building of similar style to the headhouse, which housed the trainmen's room and clerk's office, was situated at the south end of the side platform. A decorative fence, with cement posts topped with illuminated globes and metal grilles in between, protected the loop track along the sidewalk edge. 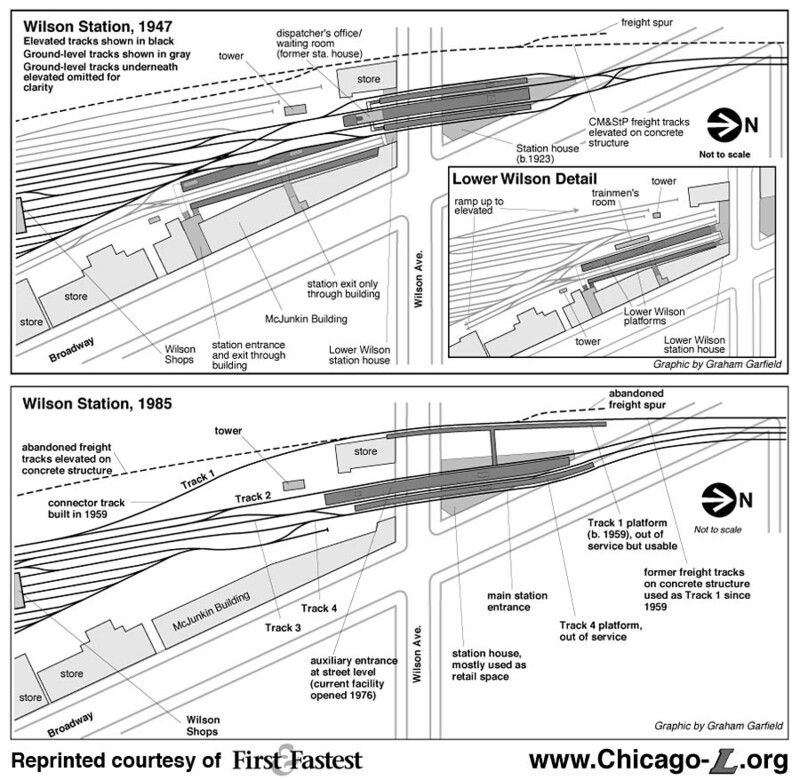 A short article in the Chicago Daily News on opening day predicted that the new Lower Wilson station, which handled all express trains, would relieve congestion at the terminal. Local trains continued to be handled at the original "upper" Wilson station. The article also noted that motors were still being switched to turn trains at the elevated stub-end terminal, suggesting that the Northwestern's conversion to multiple-unit control had not been completed. A year later, in 1908, Wilson was converted from a terminal to a through station when the Northwestern Elevated opened its extension to Evanston over the electrified ground-level tracks of the Chicago, Milwaukee & St. Paul Railway. 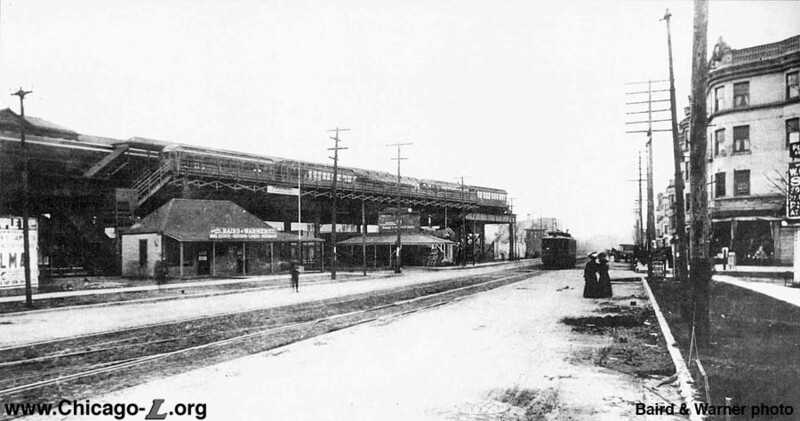 Opened on May 16, 1908, trains reached the ground-level extension by means of a short extension of the elevated structure across Evanston Avenue, then down a two-track ramp to the St. Paul's tracks. Coincident with the extension of "L" service over the St. Paul's tracks, the steam road cut its commuter operations back from Wilmette to their Sheridan Park station adjacent to the Wilson "L" stop. After the opening of the "L" extension, the St. Paul operated between Union Station and Sheridan Park. They ran this limited service until June 1917, after which the former Evanston Division of the St. Paul line just handled freight. The Northwestern took the opportunity of the opening of the extension to overhaul their operating scheme. Upper Wilson and the 1900 station house now handled Evanston trains, both locals and expresses. Lower Wilson continued to handle all Wilson-Loop express runs. Besides the myriad of express services, a Wilson-Loop local service was also operated. The area of the city around Wilson station, known as Uptown, was continuing to grow in the years after the turn of the century, as lots continued to fill in and development became denser and more urban. 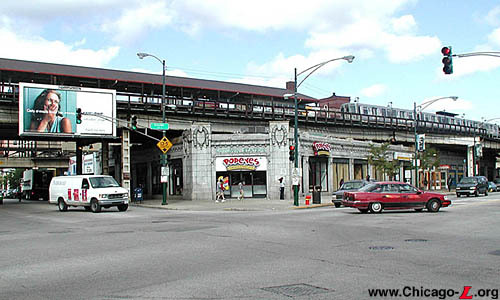 Shortly after the Northwestern Elevated's extension in 1908, the property on the north side of Wilson, between the elevated tracks and Evanston Avenue, was developed as a commercial property. The 320-by-120 foot triangular site was leased by Peter C. Stohr, assistant to the traffic director of the Union Pacific Railroad in Chicago. Stohr planned to improve the site with stores and offices, but the site had many challenges, not the least of which were that much of it was under the elevated. To overcome these obstacles and procure the best building possible, Stohr retained renowned architect Frank Lloyd Wright to design his structure. Wright was hired in 1909 to design a building that would maximize the potential of the location and deal with the challenges of the site. The Stohr Arcade Building, as it was called, represented one of several commercial buildings designed by Wright. His design for the building dealt with the site in an interesting way: most of the building was only one story tall and was tucked under the elevated structure, but where it extended out from under the "L" at the street corner the building rose two more stories, creating a more prominent elevation and making the building appear larger than it really was. Wright's design included some of the Prairie School features and motifs with which he is now so closely associated. Another element that made Wright's work more difficult is that the building was to be designed to include an entrance to the "L" above. Although not meant to be the primary entrance to the station -- that was still on the south side of Wilson Avenue -- it was to include a ticket booth and access to the platforms. Examination of Wright's plans show that he did indeed design the building to accommodate an entrance to the "L", but he downplayed its prominence in the overall building, making it simply an opening between storefronts. Although mention of this entrance appears in multiple books about Wright's works and its being is generally accepted in "L" history lore, it is highly questionable as to whether or not this entrance was ever actually built out and used. For instance, Wright's plan views and elevation views show several aspects inconsistently. Wright's drawings also include the notation "treads and risers not in contract" on the stairs from the street to the mezzanine level, suggesting that it was up to someone else (perhaps the Northwestern Elevated) to build it out and that maybe this never happened. There are also no known views from this period clearly showing the platforms in their entirety, examination of photos from the 1910s and early 1920s do not seem to show any obvious stairways where they ought to be according to the various drawings. Without additional photographic or documentary evidence, it will be difficult to know for sure whether this accessway ever existed. By the mid-1910s, less than a decade after Lower Wilson opened, the Northwestern Elevated was making plans to build a new lower station, realign the lower station tracks, and consolidate the upper and lower stations into one entrance. In 1915, Arthur Gerber produced plans for a new lower terminal that fronted onto the south side of Wilson Avenue. 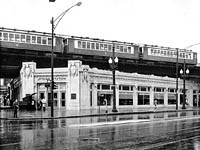 The station design was unique, of a type Gerber did not precisely repeat again, although elements would show up in his 1920 Milwaukee Terminal for the North Shore Line interurban. Gerber's 1915 station entrance design was never executed, but the plans for a rearranged station in this location continued to evolve. In 1916, Samuel Insull, the utilities magnate and chairman of the association of "L" companies known as the Chicago Elevated Railways Collateral Trust (CER), bought control of the bankrupt Chicago & Milwaukee Electric Railroad at auction. At the time the C&ME terminated in downtown Evanston, but Insull lost no time making plans to extend the interurban's service to Chicago via the "L". The scheme for a new Lower Wilson station was redesigned and finally executed circa 1917 (although the interurban was not extended to Chicago until 1919). 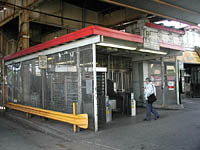 A new station entrance was built on the south side of Wilson Avenue under the elevated structure and the two platform, three track stub terminal arrangement was built to replace the loop for the lower station. The stair access to the elevated station was also integrated into the new station so that access to both Wilson facilities was consolidated. The exterior elevations consisted of small square panes of glass divided into bays by thick concrete pillars with simple Prairie School designs molded into them. A large sign that said "STATION ENTRANCE" in dark lettering on a white background, a remnant from before the new station, hung under the drip pan in front of the entrance. In 1922, the Northwestern completed the elevation of the ground-level tracks between Wilson and the city limits at Howard. As part of this project, the two-track line north of Wilson was expanded to four tracks so that, like the original portion south of Wilson, separated express and local services could be provided. However, although the elevated station had four tracks and three platforms, the north throat of Wilson station remained two tracks, creating a serious bottleneck. This capacity limitation would remain a choke point on the North Side elevated for several more decades. By the early 1920s increasing density in Uptown, growing ridership, and the demands placed upon the station by both "L" and interurban service had made the facility outmoded. 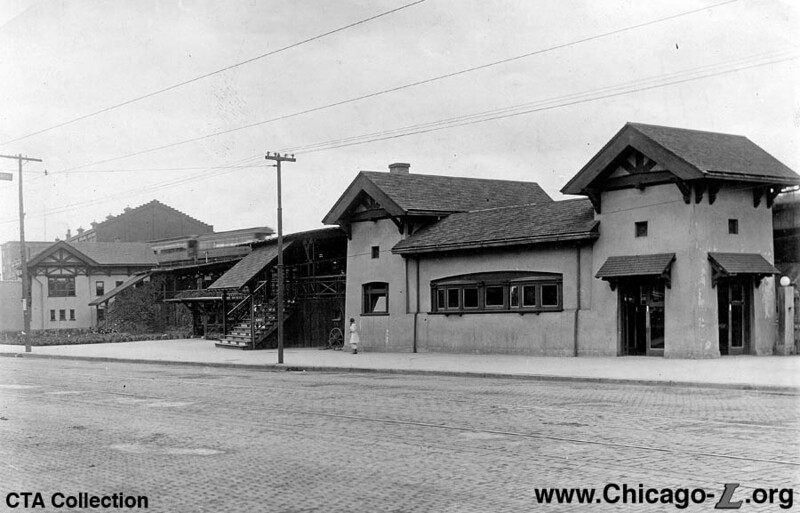 So, a new station was developed as a joint project between the Northwestern Elevated and the interurban, which had been officially renamed the Chicago North Shore & Milwaukee on June 12, 1916. 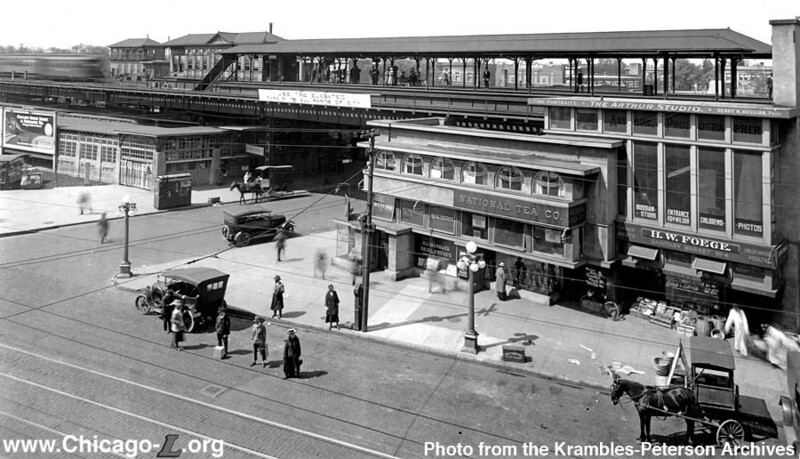 The new station facility was going to be large, so to get sufficient space the Northwestern demolished the 13-year old Stohr Arcade Building in 1922 and located their new station on the northwest corner of Wilson and Broadway. The following year the new station was constructed. Architect Arthur U. Gerber, now staff architect for Samuel Insull's electric railroads, designed a Classical Revival building of the Beaux-Arts school, constructed of brick and tile with white terra cotta facing. The design contained what were becoming Gerber trademarks, including laurel-framed cartouches, globed lights, and an overall majestic scale. 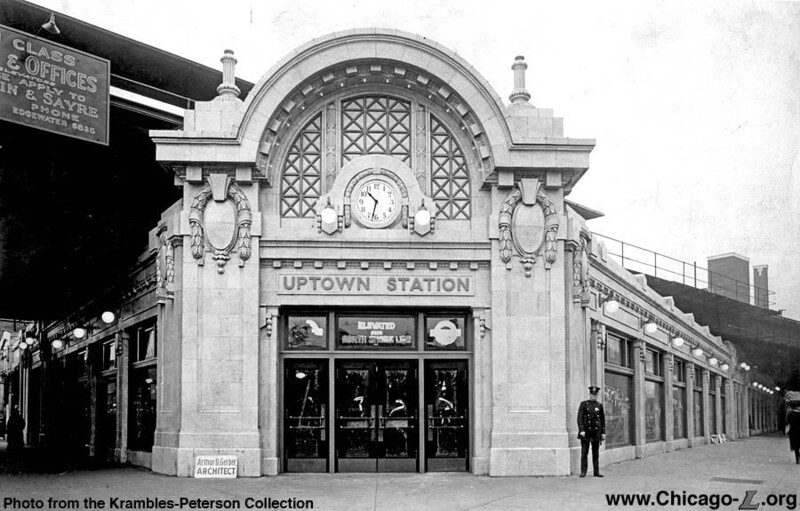 The main entrance was on the corner of Wilson and Broadway and was topped with an ornate terra cotta arched parapet and a fascia over the door that read "Uptown Station". There was also a side entrance on Broadway. The ground-floor interior of the building was a waiting room decorated with terrazzo flooring and art marble wainscoting. In line with the side entrance was a grand staircase with ornate brass handrails that led up to a mezzanine level. In front of the staircase was an agents' booth for both the elevated and the North Shore Line. Amenities in the station included a women's restroom, a smoking lounge, and telephones at street-level and, in the finished sections of the basement, men's restrooms and a large barber shop. 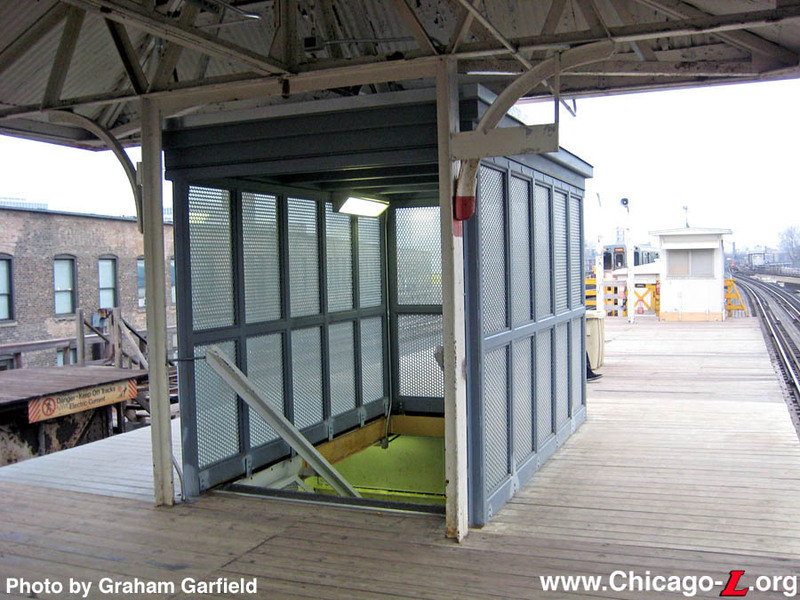 The new station also handled baggage for the North Shore Line, so another interesting feature was a freight elevator that connected the station house and the center platform. The elevator had doors both inside the station and directly onto the street. The new station served through passengers of the North Shore Line and the Evanston division of the elevated. Local trains terminating at Wilson were handled at the lower station across the street. Passengers could access both through and Wilson-terminating trains through Lower Wilson station. Construction of the new station house coincided with -- or perhaps was, in part because of -- the development and maturation of Uptown as a dense. Uptown district became the largest and most popular commercial and entertainment area on the city's North Side. At the same time as the new station was built, a new building was built across the street, on the southwest corner of Wilson and Broadway. The building contained stores and offices, but the Lower Wilson station was also integrated into the building. In addition to the existing entrance under the structure on Wilson (which was given a few facade to match the McJunkin Building, perhaps designed by Gerber as well), there were two station entrances through the building's Broadway elevation. Lower Wilson's platform configuration remained the same. McJunkin, commissioned by the McJunkin Advertising Agency and designed in a style and of materials that resembled the new Wilson station across the street, had an imperial grandeur due to its substantial height and great length along Broadway, although its east-west width was actually quite shallow. The McJunkin Building, 465 feet long, was completed in 1924 at an expense of $663,330.83. The grand three-story McJunkin Building is often attributed to Arthur Gerber, but was actually designed by architects Marshall & Fox, who were prolific architects whose work included the Drake, Blackstone, and Edgewater Beach hotels, and Uptown Bank further north on Broadway. It is unclear what Gerber's role was in the design or execution of the McJunkin Building, although one possibility is that he designed the station portions of the structure. It is interesting to note North Shore Line interests owned the McJunkin Building until the 1930s, and that ownership of the property on which McJunkin was built actually remained with the Insull interests until the 1940s. As they did with the rest of the system after taking control in 1947, the Chicago Transit Authority wasted little time in making changes to the North-South Route's operational structure and timetable, much of which impacted Wilson acutely. In the 1949 service revision, the CTA discontinued terminating trains at Wilson. Now all trains from downtown serving Wilson ran through to Howard or beyond (the only exception being a few Evanston Expresses that were laid up at Wilson Yard midday). As a result, the Lower Wilson station was closed on August 1, 1949, although the entrance on the south side of the street remained open for access to the elevated platforms. The platforms were eventually removed, as was a large portion of the lower yard, although some of the yard remained into the late 1950s and was used to store out of service wood cars. In the mid-1950s, the Lower Wilson station entrance was closed and demolished, leaving the stairs to the mezzanine and Upper Wilson exposed to the outside again at street level. At the very least, these stairs remained open as an auxiliary exit with a rotogates and may have had an agent's booth for some form of part-time entry. Another change was that when the "L" came under the auspices of the CTA in 1947, the elevated and the North Shore Line ceased to be controlled by the same private interests. With the CTA disinclined to give North Shore riders free transfers to the elevated, the CTA decided to modify the fare controls and station layouts at several common stops to eliminate most free transfers. 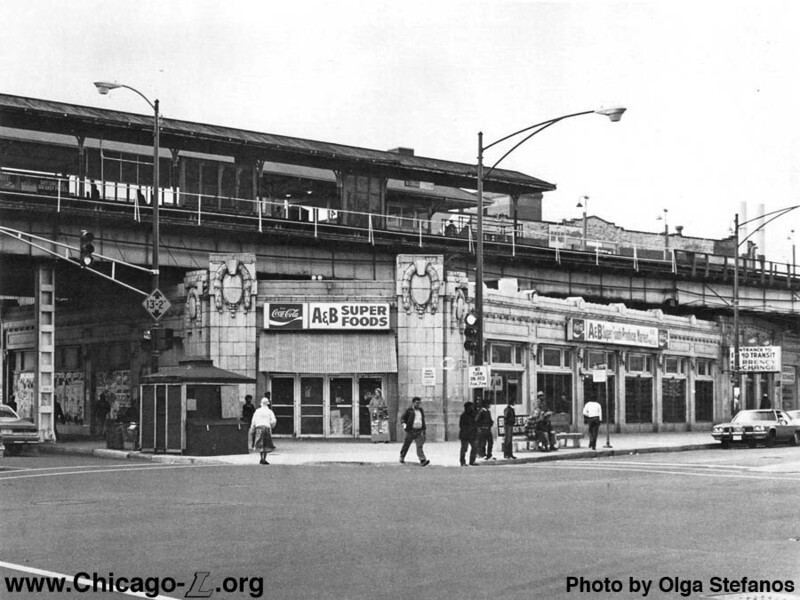 In 1953, the CTA agent was moved from the street-level booth at the base of the stairs to a new agent's booth at the mezzanine level, where the booth (now housing a Customer Assistant) remains today. 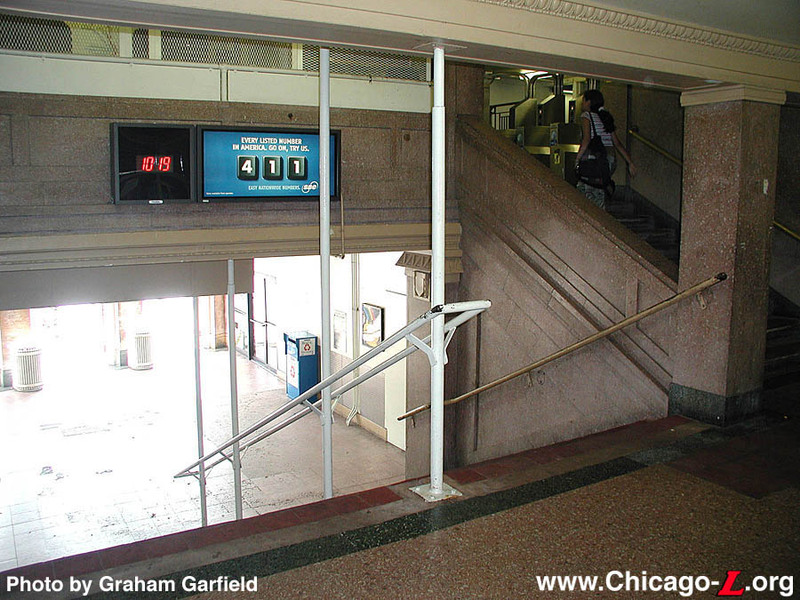 Fare controls were set up there such that North Shore passengers could reach platforms serving Tracks 1 and 4 (where North Shore trains called) without going through the CTA paid area, but North Shore passengers exiting at Wilson were routed into the unpaid area of the mezzanine. The street-level booth remained, manned by a North Shore Line agent. Interestingly, the North Shore Line and the CTA didn't see fit to separate northbound passengers, as both the northbound Evanston Express and North Shore Line used the east platform and east outer track. This was likely because those changing from CTA trains to the North Shore would be handled by the interurban's conductors, while the opposite would not happen because the North Shore was not allowed to handle local riders within the city limits. A similar North Shore-only platform was placed in service at Belmont at this time as well, for discharge-only southbound. On November 5, 1956, tragedy struck at Wilson station when a CTA train collided with a North Shore Line train. Initially, seven died and approximately 160 "L" riders were injured, although the final tally was a bit higher. For more information, click here. Other more modest improvements and changes were made around Wilson station during this period. Between 1952 and 1957, the original 1900-built station house at the south end of the center platform was removed, long-since having ceased to function as a fare control facility and used as a dispatcher's office and waiting room in later years. In 1958, a project was undertaken to clean and improve the 1923 station house. In an unfortunate loss to the building's architectural splendor, the decorative terra cotta arched parapet at the station's corner entrance was removed between 1957 and 1959. It is not clear why it was removed, nor if this was part of the 1958 renovation effort, though it likely was. By the late 1950s, the CTA decided it was finally time to correct the bottleneck that the track configuration through Wilson presented. The merging of trains in each direction down to one track was not only beginning to cause intolerable delays to service but the mingling of so many trains on so few tracks was one cause cited in the investigation of the 1956 accident. In 1958, the CTA embarked on a $1.8 million project to reconstruct about 1,500 feet of right-of-way through Wilson station into a continuous four-track system. Once complete, Evanston Express and North Shore Line trains would run on the outside tracks (Tracks 1 and 4 on the west and east, respectively) and North-South Route trains would remain on Tracks 2 and 3 on the inside. To make the job easier, Track 1 would use part of the existing concrete elevated structure used by CTA freight trains connecting to the Milwaukee Road, which diverged from the North Side Main Line at Leland Avenue and ran along the west side of the property before descending to ground-level south of Montrose. 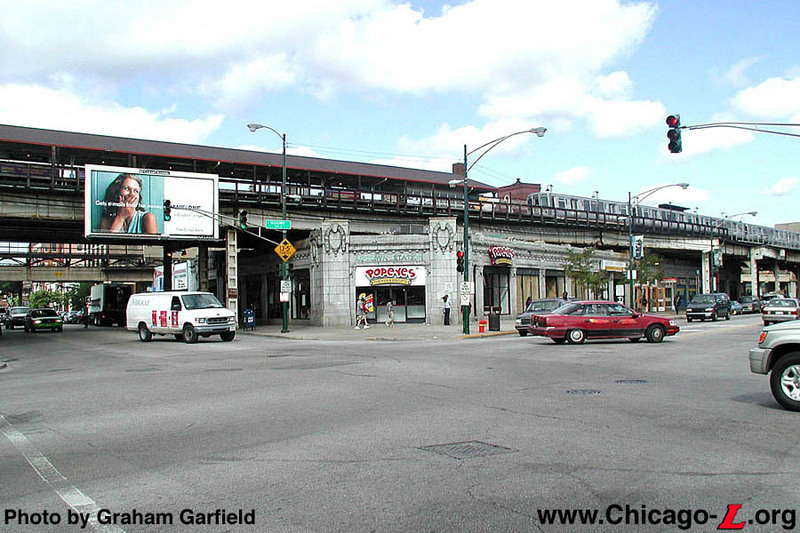 (The CTA ran freight until the 1970s over the North Side "L" from here northward. At Leland, the freight spur split off and went down to grade. The abandoned right-of-way can still be seen, complete with old overhead wire poles, until Montrose Avenue.) A new platform for southbound North Shore Line trains (Evanston Express trains having ceased to call at Wilson in 1957) would be built on this western track at Wilson and a 540-foot elevated structure would be built south of Wilson to connect the spur back to the main line. In addition, some new steel elevated structure would need to be built where the main line crossed Broadway to support the realigned three-track alignment that would remain on the existing right-of-way. The project took several years to complete and involved some complicated phasing to allow service to continue through the site during the project. The first phase constructed the connecting track between the freight lead and the existing main line, which together would constitute the new Track 1. The structure was to be a concrete deck with a ballasted trackbed supported by a single row of concrete columns. The new Track 1 entered service on November 30, 1959. The west track at the old station formerly used by North Shore Line trains was removed to make way for the passage to the new Track 1 platform , but the west island platform was left in place, though in what capacity it may have been used (if at all) is uncertain. Work continued to realign the rest of the tracks. The new Track 2 entered service on December 1, 1960 and the third phase concurrently got underway when, on August 4, 1960, all northbound trains were routed via Track 4 to allow Track 3 to be realigned. The new Track 3 was placed in service on January 11, 1961. This allowed Track 4 to be taken out of service for its realignment, which was completed and placed in service on April 19, 1961. When completed, there were four tracks through Wilson served by four platforms, allowing for smoother operation without switching delays. 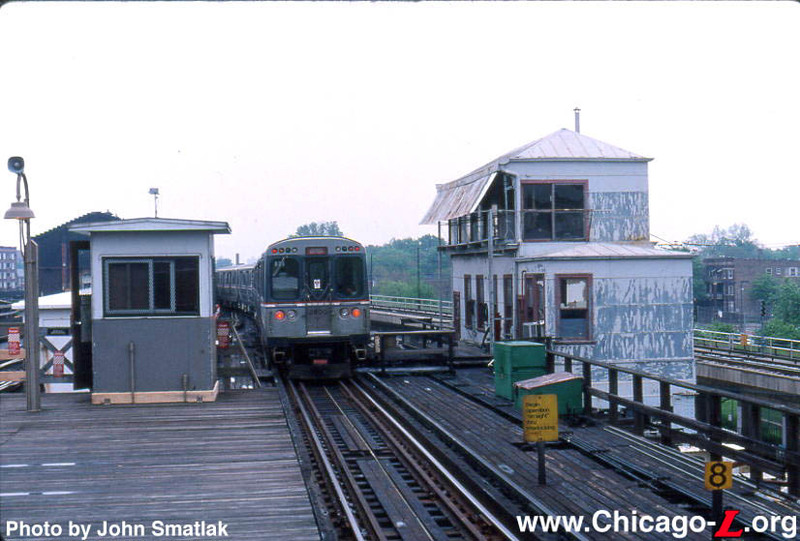 On January 21, 1963, the North Shore Line ceased operations and vacated Wilson station. With only the "L" now using the station and only North-South Route trains stopping, the large waiting room and several platforms were no longer needed. The North Shore's ticket booth was removed and both the east island platform and side platform on Track 1, used only by the North Shore Line, were removed from regular service but left in place and in usable condition. Within a year, the waiting room was converted into commercial space. 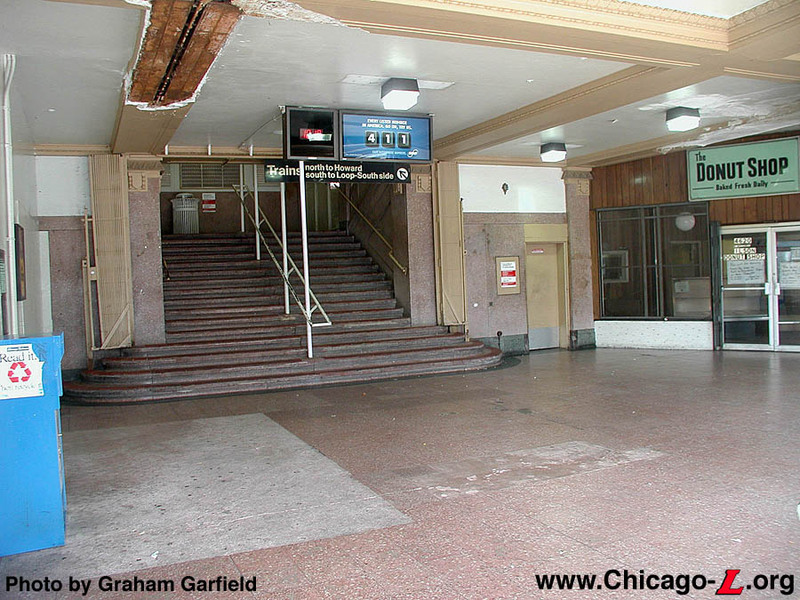 Primary access to the "L" station mezzanine was now through the side entrance on Broadway a half block north of Wilson, although the initial reconfiguration of the former waiting room left a public corridor along the Broadway elevation, outside the tenant's space, through which one could reach the newly-delineated lobby by way of the entrance at the corner of Wilson and Broadway. In later years this corridor was eliminated. The first tenant was the A&B Food Mart, a grocery store that had already occupied the rental space adjacent to the station on the Wilson frontage for several years. A&B Foods now occupied both spaces, so a connecting doorway was punched through the common wall where the ladies restroom and telephone banks had previously been. Meanwhile, the portion of the waiting room to the north of the side entrance was partitioned off into two rental spaces as well. A short order restaurant first occupied the space adjacent to the side entrance lobby, while a smaller space within the lobby next to the doors housed a currency exchange. 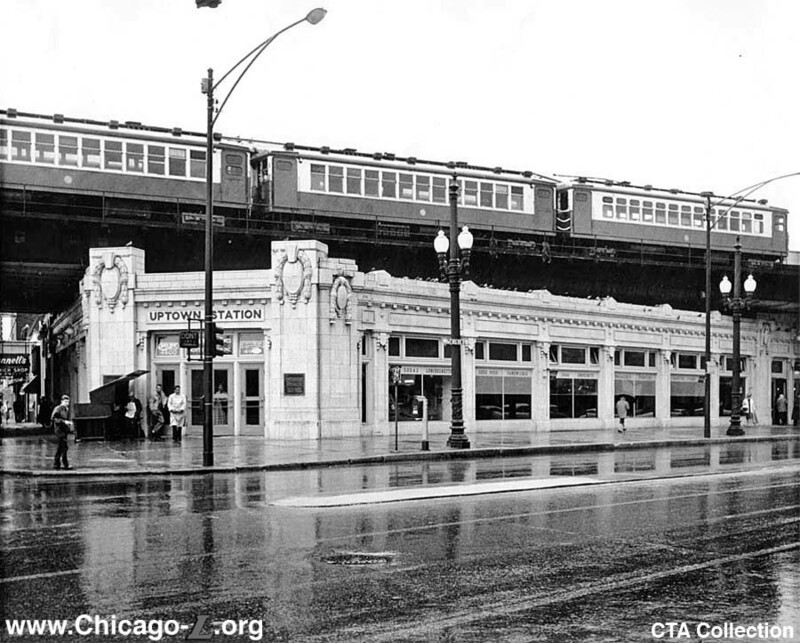 The conversion of the Wilson station house from a stately rail station to a series of transitory rental spaces that also happened to house an "L" entrance coincided with larger changes in the Uptown area. During the 1950-60 decade, the population of Uptown declined. During the 1950s, many apartments were subdivided into smaller units, rooming houses, and single-room occupancies more suitable for individuals than families or couples. Still, some modest improvements were made to the station. The original west island platform, not used in regular service since 1959, was removed around 1975. The next year, Wilson received a new auxiliary entrance to coincide with the establishment of the new Harry S. Truman community college adjacent to the "L" on the west. Residents of the community wanted to ensure their access to this new institution, so in September 1976 a new auxiliary entrance was opened on the south side of Wilson Avenue, which was nearer to the college than the main entrance. At street-level, it was a simple chainlink enclosure covered with a canopy and housing a rotogate, a turnstile and an agent's booth, used only for entrance Monday-Friday rush hours. Incredibly, the stairs up to the platform are, in part, the same stairs from the original 1900 entrance to the station. 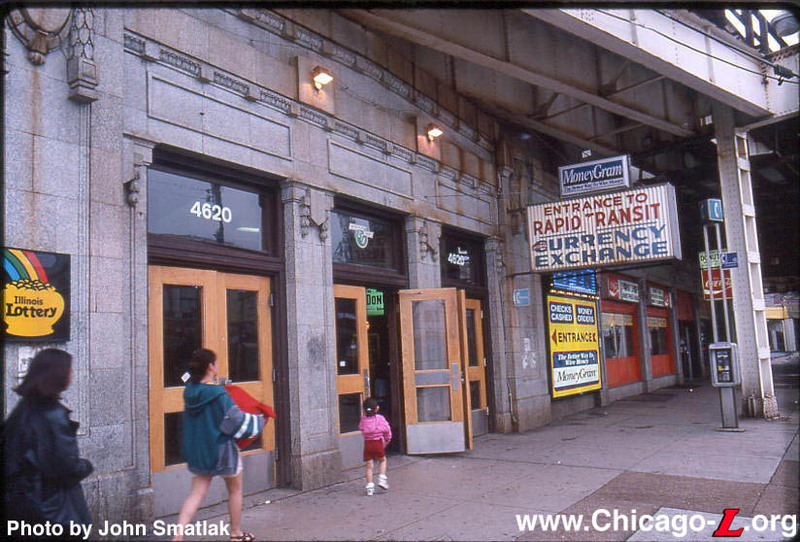 In a service revision on February 10, 1992, the auxiliary entrance was closed, remaining an exit, but was later reopened as an unmanned entrance with farecard-only high-barrier gates once the CTA switched to electronic fare media in the late 1990s. 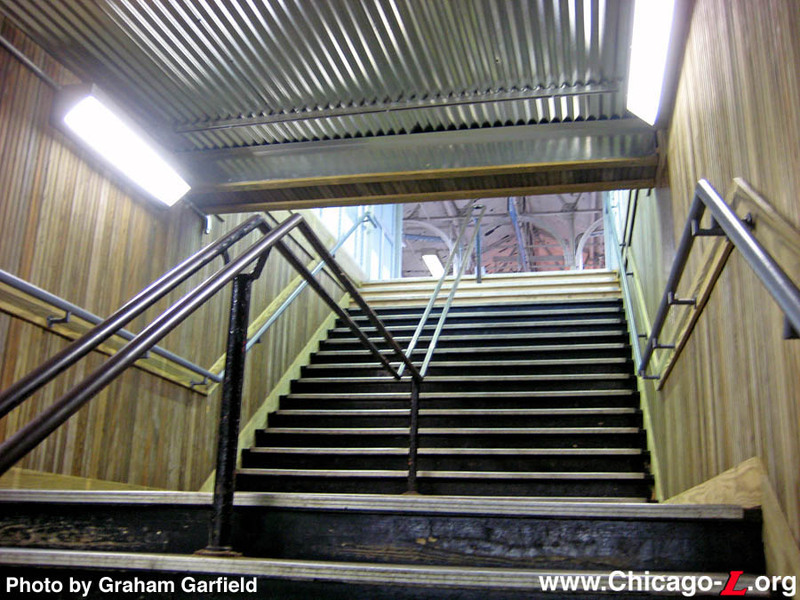 Deteriorated sections of original pressed steel were still present at the mezzanine level on the century-old center stairs until a series of improvements to the station were made in 2008. By the mid-1980s, the interior of the station house had been further subdivided. A&B Food Mart moved out and the space between Wilson and the side entrance was partitioned into three separate rental spaces. 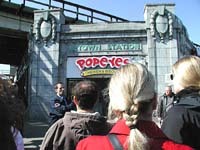 The corner entrance was now home to a Popeye's Chicken, which still occupied the space for several years until vacating the space circa 2010. The Purple Line (Evanston) Express passed through the station on tracks 1 and 4 without stopping, while Red Line (North-South) trains used tracks 2 and 3, stopping at the wide center platform. Beginning on March 24, 1997, the canopy on the narrow east island platform was removed, the platform long since out of service and its stairway sealed. The side platform on Track 1 was also not in regular use, but was kept in serviceable condition and occasionally used on charters and reroutes. 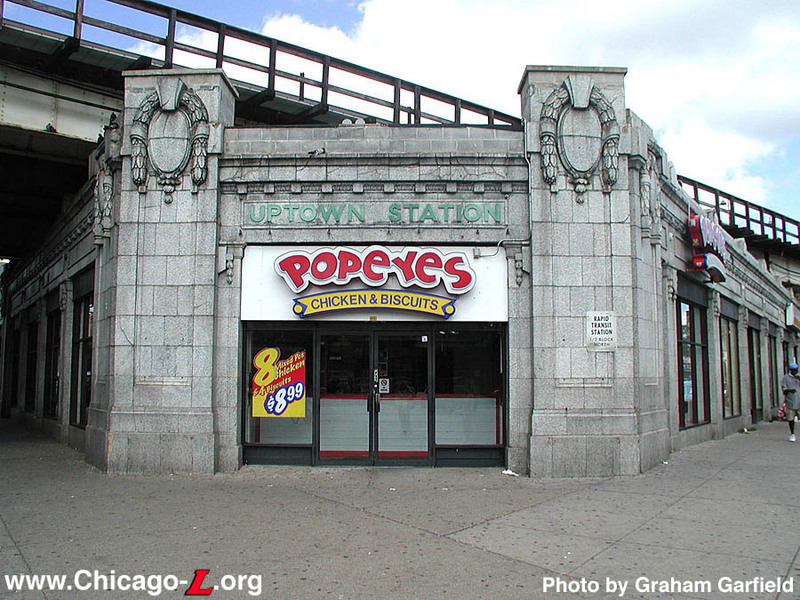 Circa 2000, Popeye's Chicken re-situated its illuminated sign over the corner entrance, lowering its height and revealing the "Uptown Station" lettering over the doorway for the first time in decades. The station is now listed as a contributing structure in the Uptown Square Historic District on the National Register of Historic Places, added to the register on November 8, 2000. During 2008, while larger-scale renovation plans were put on hold, several improvements were made to the facility throughout the year to provide an enhanced station environment and customer experience on a modest budget. Upgrades were made piecemeal throughout the year so as to not disrupt usage of the station more than necessary. Service changes to accommodate work commonly included temporary closures of the main or auxiliary entrance for weekend periods, rerouting of train traffic to the express tracks 1 or 4, resulting in either bypassing the station (for northbound trains) or stopping at the old North Shore Line platform on Track 1 (for southbound trains). Improvements were generally limited to the island platform between tracks 2 and 3 used by Red Line trains. Upgrades made during the project included replacing the wooden platform deck and installing tactile edging, stripping and repainting the original 1900-vintage platform canopy, replacing the corrugated metal hipped roof on the canopy, installation of new lighting under the canopy, replacement of wayfinding and identification signage on the platform, reconstruction of some of the support stringers and joists under the south end of the platform, and reconstruction of the stair enclosure kiosks for both the stairs to the main and auxiliary exits. The auxiliary platform on Track 1 was officially removed from service at 9:30am, Wednesday, October 20, 2013, with trains prohibited from stopping at the platform thereafter. For the last several years the platform had been only occasionally used for special operations such as charters and during periods when southbound trains were rerouted from Track 2 to Track 1 for maintenance or construction. Today, the 1923 Beaux-Arts station and 1900 island platform remain in good condition, standing as well-worn landmarks in the historic Uptown district. Wilson station has been on various rosters for renovation for several years. As far back as the 1970s, the station was listed as being in CTA's capital plan of stations to be rebuilt. By the next decade, capital funds had been programmed for design engineering of the new station, although construction funds were not programmed. By the 1990s, a new station had indeed finally been designed. Somewhat resembling an Orange Line station in layout, the proposed facility would have been on the south side of Wilson Avenue, roughly where the auxiliary entrance and adjacent storefront are. The 1923 station house would have been vacated by the transit authority, perhaps completely converted to commercial space. This plan was not executed, however due to a lack of construction funding. 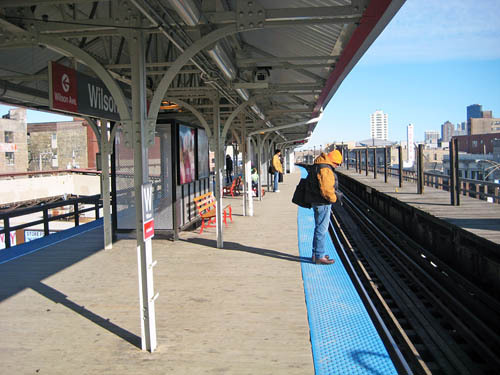 The next attempt to renovate Wilson station came as part of the CTA's 2004-2008 Capital Improvement Plan, which provided funding for the design and reconstruction of the station and the associated track work to the north and south. 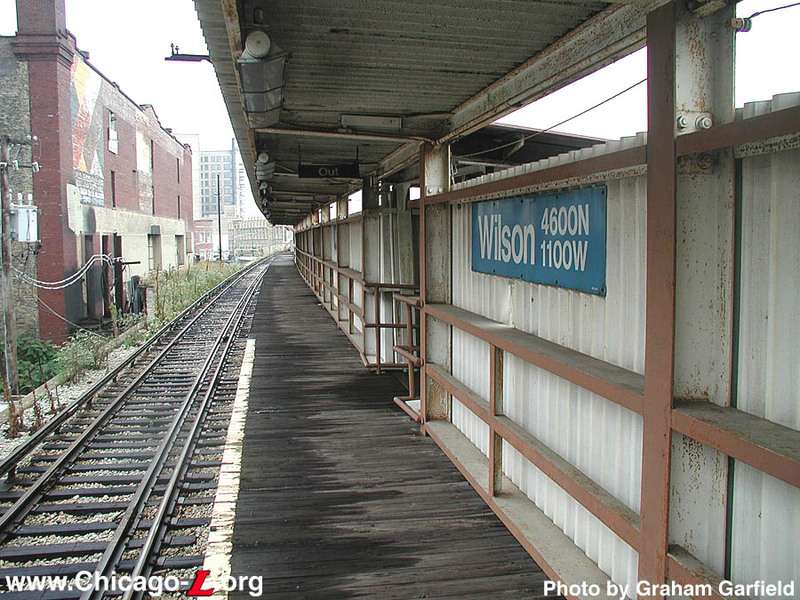 The rehabilitation of historic Wilson station moved closer to reality with the approval of a contract for the design of the renovated station at the Chicago Transit Board's monthly meeting on January 12, 2005. 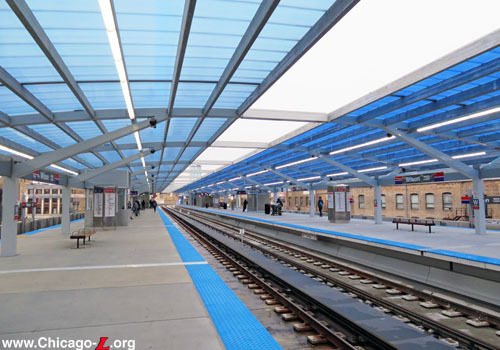 Through a competitive bid process, CTA named Wilson Transit Associates (WTA) a Joint Venture as the recipient of the $1.75 million design contract, which covered the first phase of design. The design was to be carried out in three phases. The first phase included refining three design alternatives for the Wilson station to 10 percent completion. Phase II was to take the selected alternative and develop it to the 30 percent design level, and the third and final design phase will develop the concept to the 100 percent design level. WTA a Joint Venture was a partnership between Parsons Transportation Group, Inc., McDonough Associates Inc., and Architrave, Ltd., of Chicago. The plans for rehabilitating Wilson station under this project included the addition of modern amenities while preserving the station's historic architectural features. The renovated station would have been fully accessible to people with disabilities and offered upgraded customer amenities, such as new platforms, signage, overhead heaters and an elevator. The 1923 station house, listed as a contributing structure in the Uptown Square Historic District, was to be preserved, rehabilitated, and integrated with the new station facility in some manner. Construction on the new station and track improvements was scheduled to begin no sooner than 2008, with the exact date depending upon the availability of capital funds. 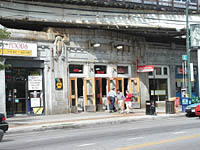 On October 18, 2006, the Chicago Transit Board approved funding for the second phase of design work for Wilson station. The $2.3 million contract amendment provided the necessary funding to take the design concept from the 10 percent design phase to 30 percent. The approved amendment brought the total design contract for Wilson station to $3.5 million. Phase II design was expected to be complete in 2007, but the project was cancelled before the second phase was completed. Funds for the project were reallocated to other capital needs and the plans set aside. In 2010, interest again developed in pursuing the renovation of Wilson station. Initially, small grants and funding sources were identified to perform modest upgrades. 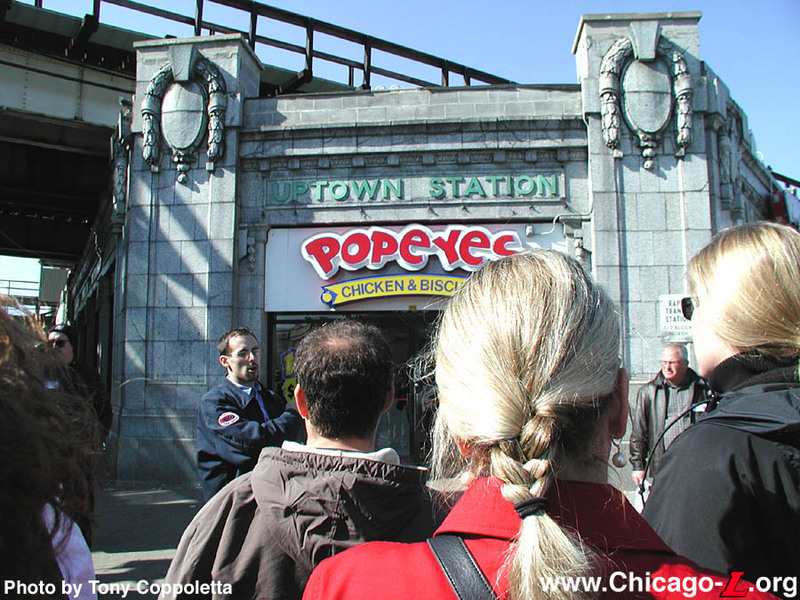 In February 2010, the CTA Board agreed to tap up to $3 million in Tax Increment Financing from the adjacent Wilson Yard TIF District to perform enhancements to the Wilson station. Planned station improvements include replacing flooring, walls, windows and railings inside the station, replacement of the roof, electrical system, plumbing and heating/cooling units, and revamping concession spaces in the historic Wilson station house. In October 2011, a $6 million grant was announced which was be used to modernize the Wilson station. The work was to include a new elevator and exterior rehabilitation, officials said. 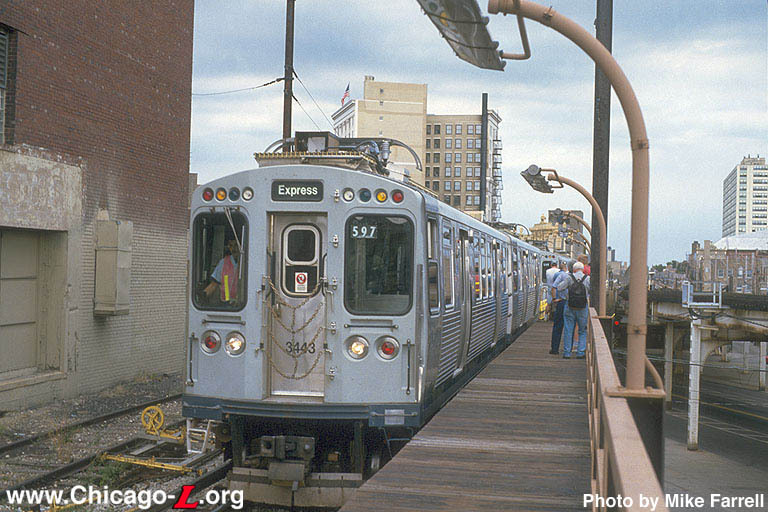 On November 3, 2011, Governor Pat Quinn, Chicago Mayor Rahm Emanuel, CTA President Forrest Claypool, several state lawmakers, and nearly a dozen aldermen announced a $646 million state capital investment grant to improve infrastructure on the Red and Purple lines. This latest investment comes from the $31 billion Illinois Jobs Now! state capital construction grant Quinn signed into law in 2009. In all, the state's share of the project tops $700 million, with another $255 million from the federal government, and about $44 million from the city of Chicago, for an overall commitment of $1 billion for several improvement projects on the Red and Purple lines. Among the Red Line improvements are plans to rebuild the Wilson station along with the surrounding track. 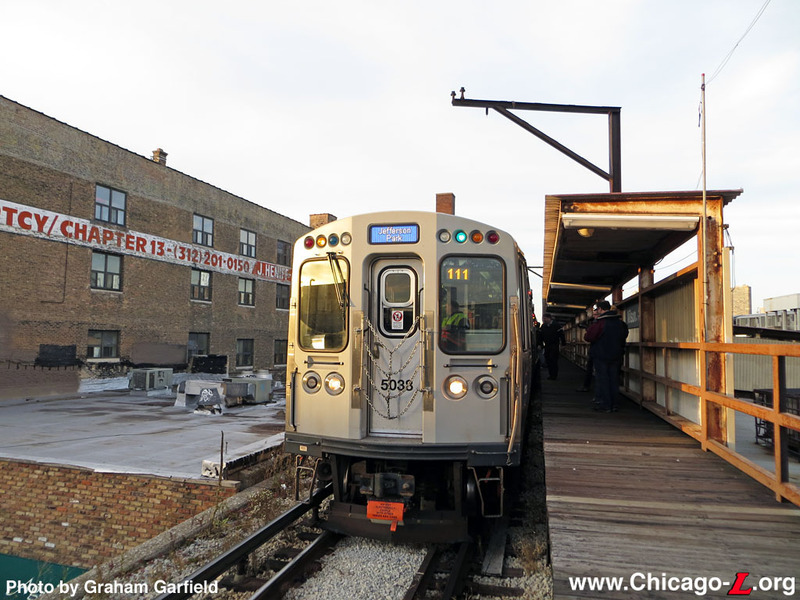 As CTA began the next phase of the Wilson Reconstruction Project, track 1 -- the westernmost, southbound Purple Line Express track -- was closed for demolition over the weekend of March 6, 2015. This began a multi-year period of three-track operations through Wilson station, similar to the operations for construction phasing that took place at Belmont and Fullerton in 2007-08 for those stations's reconstruction. Three-track operations began Monday, March 9, 2015. Southbound Red Line and Purple Line Express trains share a single track -- track 2 -- between Lawrence and Belmont for one year, with Purple Line trains merging onto track 2 through a new crossover at Leland whose installation was completed over the weekend before three-track operations began. Although the right-hand crossover from track 2 back to track 1 at Montrose is outside of the construction zone and remained in service, it is a non-interlocked hand-throw switch, making its use to re-sort trains slow and likely to cause excessive delays given the close headway of the combined Red and Purple lines. As such, Purple Line trains were kept on track 2 all the way to Clark Junction, where they were sorted back onto track 1 by the tower. Because they were on the same track as the Red Line, and might likely catch up to their Red Line leader on the same track if they ran express, as well for added customer convenience, Loop-bound Purple Line Express trains added stops at the Wilson, Sheridan and Addison stations during this phase of the project, but during morning rush only. Loop-bound trains in the evening rush, as well as all Linden-bound trains, continued to bypass those three stations. By late April, the single-track concrete deck structure that brought southbound express trains on the old freight lead back to the steel elevated structure south of Wilson Avenue -- itself opened in 1959 as part of the last major track reconfiguration and improvement at Wilson -- had been demolished. Nearly all of the side platform installed on the old freight track had been removed, and work on demolishing the old concrete freight viaduct was underway. Over the weekend of September 16-17, the new track 4 was cut-in at Sunnyside just south of the station and at Leland north of the station; on Monday, September 18, this new northbound express track was brought into service. Linden-bound Purple Line Express trains began using the track during that morning's rush period. While the track passed through the new northbound island platform -- the east platform of the pair of island platforms -- the platform remained under construction and closed, with trains bypassing it. Howard-bound Red Line trains continued using track 2 through the station, and calling at the east platform. At 4am, Wednesday, September 20, 2017, the new, permanent Wilson station main entrance on the south side of Wilson Avenue opened. With its opening, the Wilson station was accessible to customers with disabilities, with an elevator, escalator and stairs between the station house and platform. The entrance on the north side of Wilson Avenue temporarily closed at the same time to complete its construction and conversion to a farecard-only auxiliary entrance. There were no changes to boarding or exiting trains. Over the weekend of October 21-22, 2017, track 3 was cut-in at Wilson Interlocking just south of the station and at Leland north of the station, connecting to the existing track 3 at those locations. This allowed Howard-bound Red Line trains to remain on track 3 through the station, which they began doing late evening on Sunday, October 22. At 4am, Monday, October 23, the new east platform at Wilson station opened. Howard-bound Red Line trains and Linden-bound Purple Line Express trains began stopping at the east platform. The east platform can be accessed by stairs, escalator and elevator, and is ADA-accessible. 95th-bound Red Line trains and Loop-bound Purple Line Express trains continued to stop at the west platform. both on track 1 for the time being. Concurrent with the east platform opening, Purple Line Express trains began stopping at Wilson in both directions, during both the morning and evening rush periods -- during all times of Purple Line Express service. 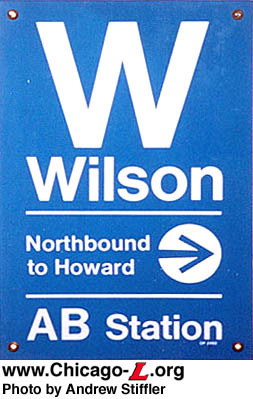 Wilson thus officially became a transfer station between Red and Purple line trains. In addition, the station entrance on the north side of Wilson Avenue reopened at 4am, Monday, October 23 as a farecard-only auxiliary entrance. Access at the north auxiliary entrance is through High-Barrier Gate turnstiles, and entry requires a valid farecard. The third of three new entrances to the Wilson station, at Sunnyside Avenue, opened at 4am, Friday, December 1, 2017. The entrance has a small street-level station house in the same style as the main entrance on Wilson, situated at the end of Sunnyside, under the elevated tracks. The interior features two High-Barrier Gate (HBG) turnstiles, as well as an ADA-accessible entrance gate. It includes a Customer Assistant kiosk, allowing the station to be staffed if desired (the HBGs would allow it to be unstaffed as well). The new entrance also includes two fare vending machines, security cameras, and a digital train arrival screen. The entrance is connected to the platforms by means of stairs and a series of ADA-compliant ramps. The Sunnyside entrance provides convenient access to retailers including Target, Aldi's, Truman College, and other neighborhood businesses and residences. Thanks to Roy, Benedict, John Horachek, Walter R. Keevil, Bruce G. Moffat, and Art Peterson for contributing information. 1. 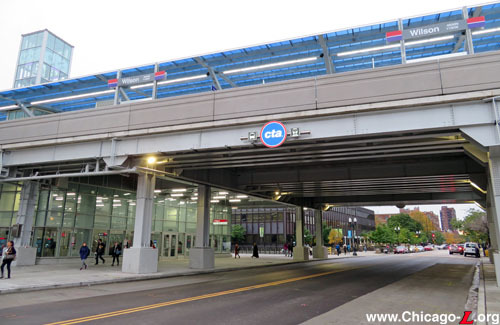 "Mayor Emanuel Offers First Look at Planned Wilson CTA Station". CTA press release. October 4, 2012. 2. 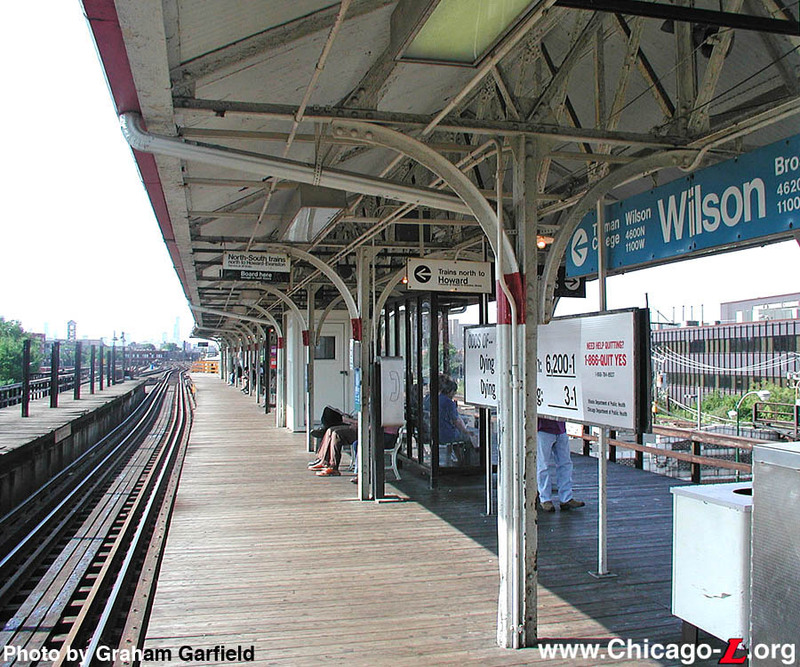 "Major Reconstruction of CTA Wilson Station Moves Forward". CTA press release. May 3, 2013. 3. Swartz, Tracy. 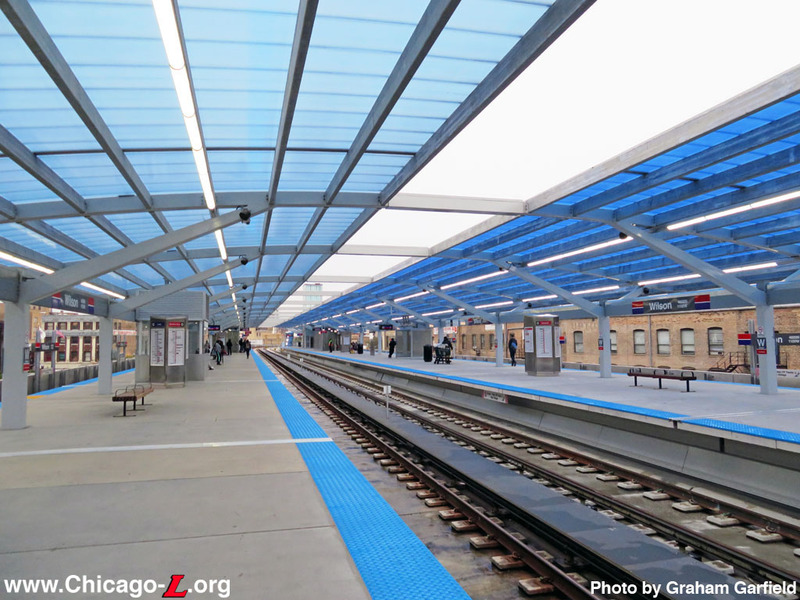 "CTA extends bid deadline for Wilson contractor." Red Eye, August 29, 2013. 4. Emmanuel, Adeshina. 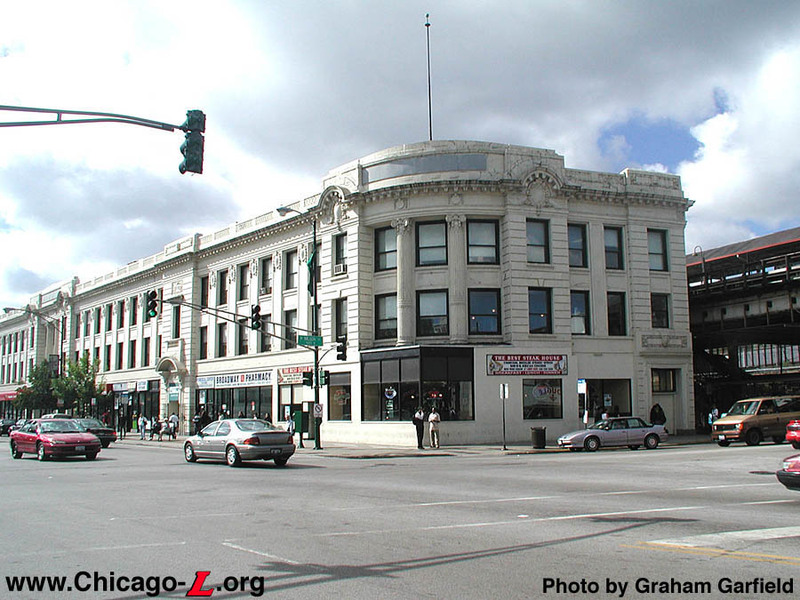 "Wilson Red Line Rehab: Some Businesses Don't Want Support Beams on Sidewalk." DNAinfo Chicago. August 30, 2013. 6. Emmanuel, Adeshina. "Wilson Red Line Rehab: A Win for Critics in Column Placement Debate." DNAinfo Chicago. October 30, 2013. 7. Emmanuel, Adeshina. "Wilson Red Line Rehab: CTA Narrows List Down to Five General Contractors." DNAinfo Chicago. November 15, 2013. 8. Emmanuel, Adeshina. 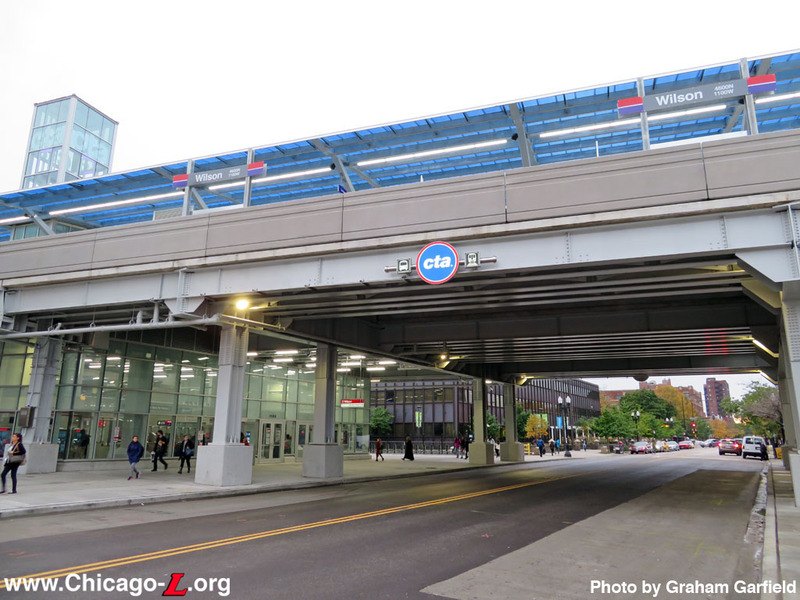 "Wilson Red Line Station Rehab Moves Forward as CTA, Residents Compromise." DNAinfo Chicago. February 19, 2014. 10. Cox, Ted. "CTA Wilson Rehab Inches Forward, $3M TIF Deal Reaffirmed." DNAinfo Chicago. March 12, 2014. 12. 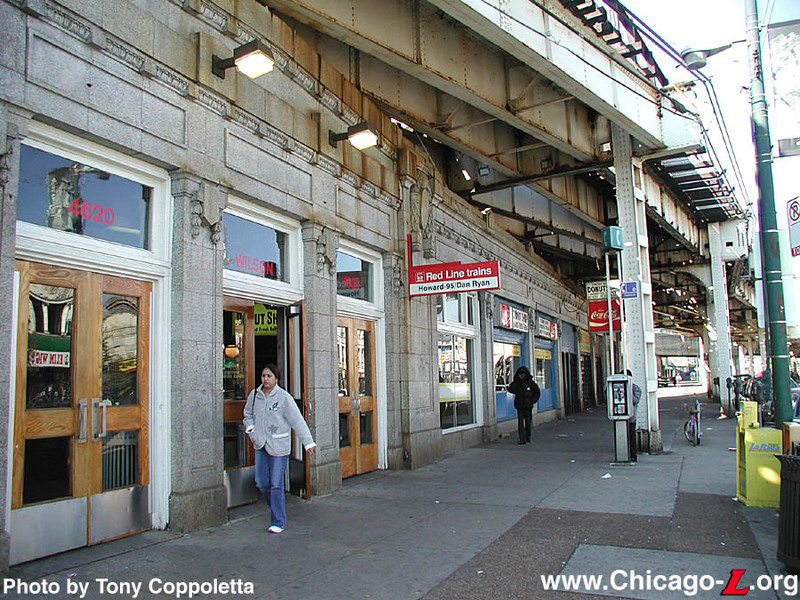 "Wilson Red Line Station Rehab Moves Forward as CTA, Residents Compromise," ibid. 13. 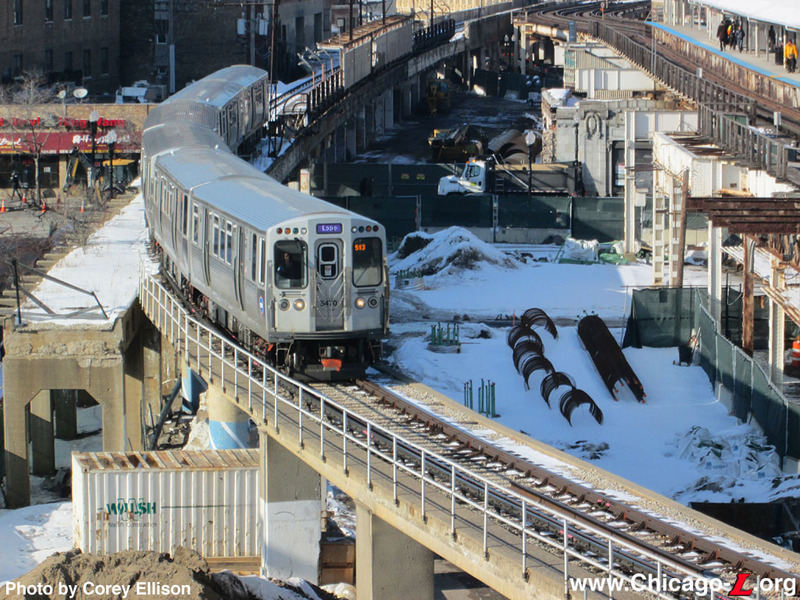 "CTA Moves Forward with 95th, Wilson Station Projects". CTA press release. June 11, 2014. 14. 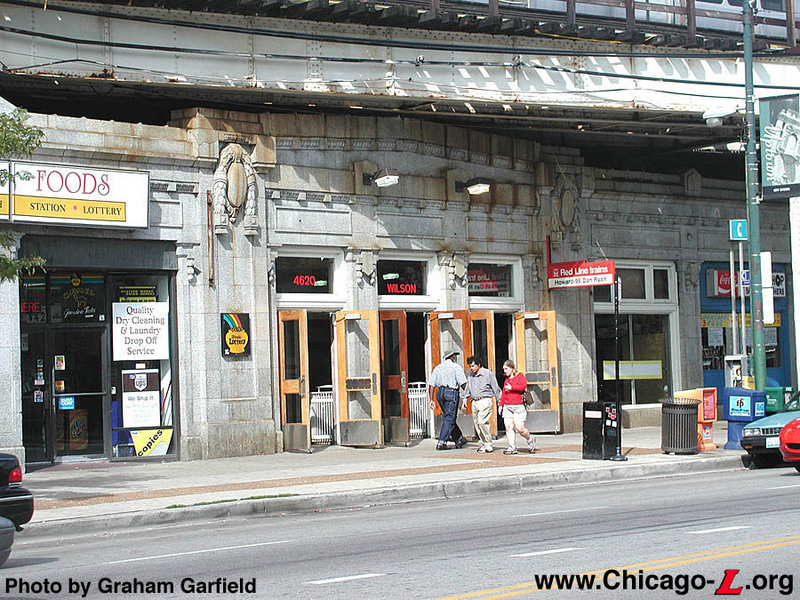 "Wilson Red Line Station Rehab Moves Forward as CTA, Residents Compromise," ibid. 15. 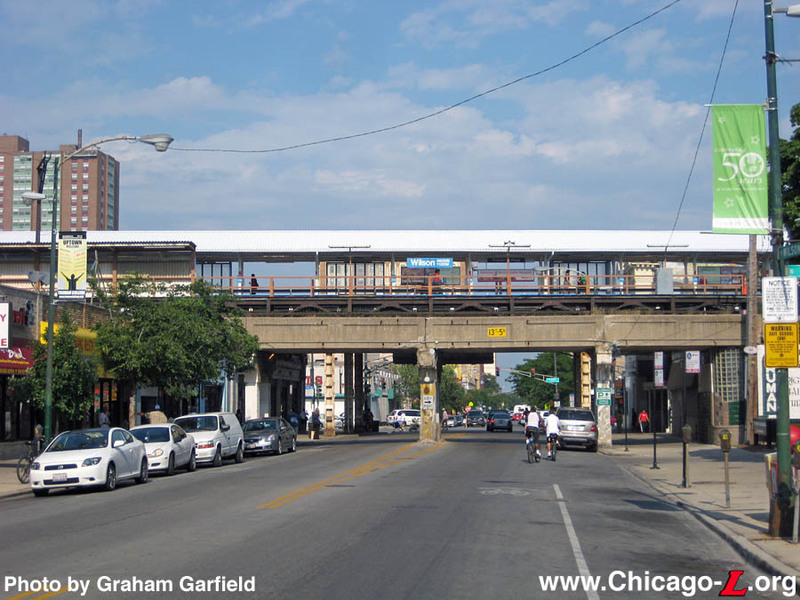 "Wilson Red Line Rehab: CTA Narrows List Down to Five General Contractors,: ibid. 16. CTA press release. May 3, 2013, ibid. 17 . "Mayor Emanuel Offers First Look at Planned Wilson CTA Station", ibid. 18. 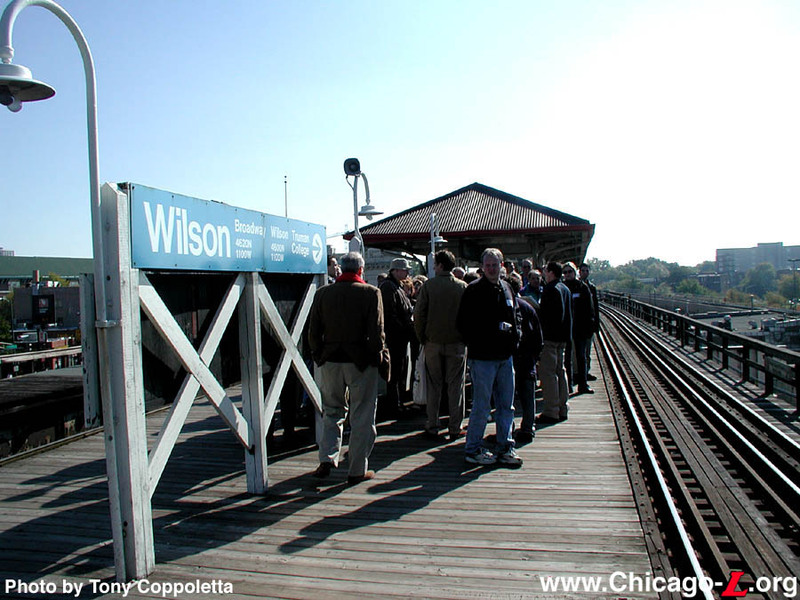 "Major Reconstruction of CTA Wilson Station Moves Forward", ibid.